In punishing operating environments like mining, heavy equipment must take a beating and come back for more. Kaydon slewing bearings and Cooper split-to-the-shaft roller bearings have been helping mining owner/operators minimize downtime and maximize productivity for decades. 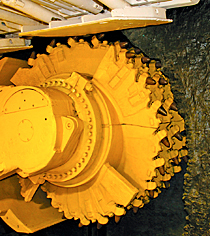 Kaydon Bearings and Cooper Bearings are leading global manufacturers of bearings that increase profitability in surface and underground mining operations around the world. With outer diameters of up to 282" (7.2 m), Kaydon slewing bearings are ideal for shovels, excavators, stacker reclaimers, and other large mining machinery. Kaydon remanufactures and provides new replacements for any OEM's bearing, with fast delivery and as-new or better performance. 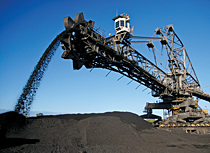 Mine operators have found they can save up to $250,000 compared to an OEM replacement bearing. The Kaydon bearing remanufacturing program returns worn bearings to service in like-new condition. Kaydon's inventory of replacement slewing bearings includes new replacement bearings for popular hydraulic shovel and excavator makes and models. 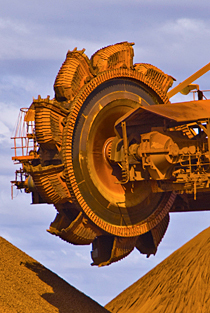 Learn more about how much mine operators have saved in our mining solutions newsletter. New and refurbished bearings are readily available from our ISO 9001:2008 certified plants. Kaydon TR series: three row roller bearings to 240"
Kaydon XT series: four-point contact ball slewing ring bearings to 240"
Cooper's split roller bearing is a liberating element in the design of new mining machinery, and a perfect drop-in solution where solid bearing replacement would be too time- and labor-intensive. 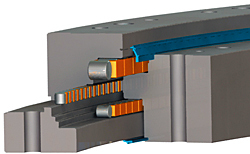 Cooper compact split bearings provide long life and ease of maintenance, withstanding the most demanding conditions. 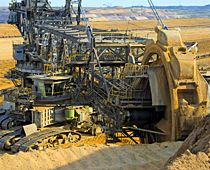 Bearings are available in a wide range of sizes (1-3/16" to 60") and a variety of series (from light duty to extra-heavy duty), for a range of mining applications including material handling; hauling and winding; stockpile and surgepile management; and screening, sizing, and washing. Cooper seals provide excellent flexibility in difficult mining environments with full integrity and minimal foreign material ingress. Cooper bearings are manufactured at ISO 9001 and ISO 14001 certified facilities in England. 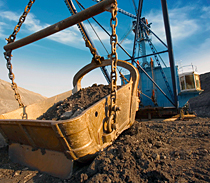 Learn more about Cooper bearings for mining applications. Cooper 100 series: compact, high speeds, 3" to 6"
Cooper 01 series: medium duty/loads, a variety of speeds, 1-3/16" to 4-1/8"